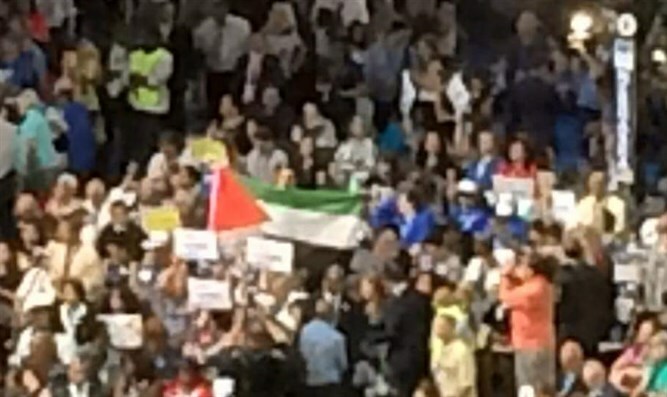 Activists using the title "Progressive for Palestine" raise Palestinian flag in audience during platform vote at DNC. The Democratic National Convention (DNC), opened in Philadelphia yesterday (Monday) under a cloud of scandal, as recent leaks of emails between Democratic party officials showed a clear bias in favor of Hillary Clinton over Senator Bernie Sanders in the race for the party's nomination, together with a readiness to actively interfere in the primary process. Nevertheless, Senator Sanders did indeed call for his supporters to campaign and vote for Clinton on the first day of the convention, but the influence of his campaign in pulling the party to the left is still tangible. One of the consequences of the leftward swing within the Democratic party has been a renewed questioning of its support for Israel. Support for the Jewish state has traditionally been a bipartisan issue in the US but Sanders had been associated with some anti-Israel sentiments, in spite of his being Jewish. He called for a "more balanced" Middle East policy, and greatly exaggerated the Palestinian death toll in operation Protective Edge. He even employed a "Jewish Outreach" staffer who made vehemently anti-Israel statement on the internet, ultimately suspending her. The Sanders campaign has thus become associated with a new, more extremely "progressive" wing of the Democratic party, and that wing reared its head at the DNC yesterday. Activists identifying themselves on twitter as being "Progressive for Palestine" raised a Palestinian flag in the middle of the convention floor, making it clearly visible to the overhead cameras, and held up signs reading: "I support Palestinian human rights." Rabbi Shmuley Boteach, in attendance at the convention, had this to say about the phenomenon.